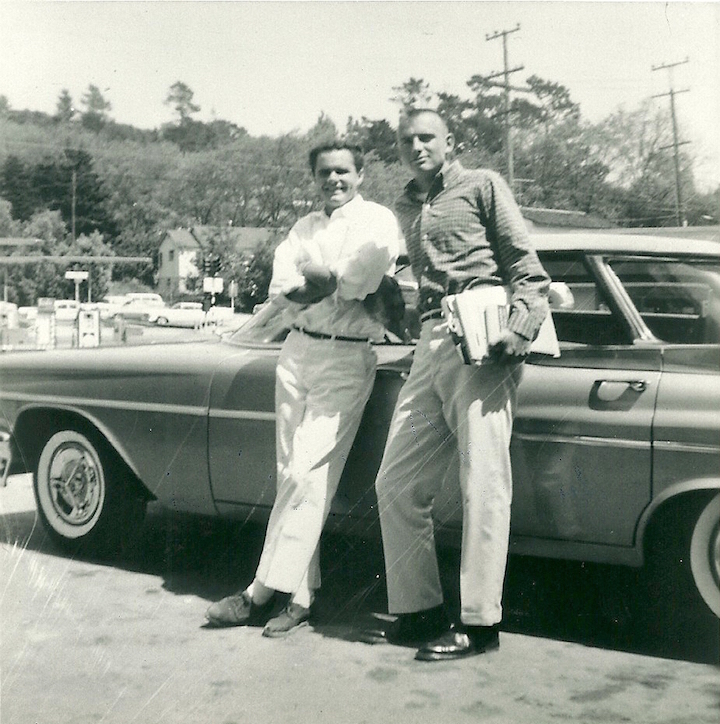 Two future leaders in the Marin County fire service shown attending College of Marin in 1960. (l-r) Ron Darrington, who would eventually retire as a Battalion Chief in the Kentfield Fire Protection District, and Bob Mariani, who would retire as Fire Chief of Kentfield FPD. Photo courtesy Art Wedemeyer. by Chief William “Bill” Lellis, Larkspur FD, retired. In the early 1960’s, most Marin County Fire Departments were making the transition from having a paid fire chief, typically supported by volunteer firefighters, to having more paid personnel on duty 24 hours a day, typically with a work schedule of 72 hours per week. Many communities in the county were experiencing a doubling of their population in the 1950s, and into the 1960’s and 1970’s. With this growth came larger and taller buildings, much more traffic, and the introduction of some hazardous materials. These changes would require many departments to add a second station or more. With this came the need for more formal fire education. In the late 1950’s into the 1960’s, most FD training happened perhaps once a week, and on an occasional Saturday. The primary textbook was called the “State’s Little Red Book.” Outside the fire departments themselves conducting in-house training, it was offered by The California State Department of Education through the offices of Thomas Ward, a former Red Bluff Fire Chief, and Ed Bent, a former LA City Fireman. In the Marin and Sonoma county regions, the lead State instructor was a gentleman named Harvey Gruber. He worked out of his home in Santa Rosa. At the request of any department’s chief, Harvey would come and teach classes such as “Use of Fire Apparatus and Equipment” and “First Aid and Lifesaving Operations”, to name a few. These classes were from 15 to 36 hours in length. They were taught in the evenings and on weekends in order to accommodate the volunteers work schedules. In early 1962, a group of training personnel approached the Marin County Fire Chief’s Association to inquire if, through the College of Marin, it would be possible to create a fire science program similar to those being offered in Southern California. Chief Ray Picard had developed the first college Fire Science program in Southern California. The degree program was developed around the 13th edition of the National Fire Protection Association handbook; our program became the fifth California Junior College to offer this as two-year degree. Today there are over 60 College institutions offering a degree in Fire Science, now often called “Fire Technology”. This set into motion the training for the next generation of fire service leaders. The first instructor was Captain Jack Kidder of Novato Fire Protection District. Historically it was taught in room 102 of Olney Hall. Dr. Albert Olney was the first president of Marin Junior College, which opened its doors in 1926. In 1963 there were not a great deal of texts for an instructor to draw upon. Captain Kidder selected a text titled “ Fire Service Training”, published by the Ohio Trades and Industrial Education Service in 1962. The book was black in color with a red fire steamer on the cover with red letters. All classes were offered on a shift-friendly basis. In four semesters a student could receive a two-year degree in Fire Science, or a 30-Unit Fire Science Certificate. Captain Jerry Van Soest of the Marin County Fire Department was the first recipient of the A.S. Degree. Captain William Lellis of the Larkspur Fire Department earned the first 30-Unit Fire Science Certificate. The Fire Science Program location at the College of Marin became a wandering gypsy of sorts. In the entire history of the program, the fire science committee could never get the College to commit to one classroom dedicated to our program, so we wandered from classroom to portable classroom to fire station engine rooms. A permanent classroom would allow us to display various fire equipment exhibits, but it was not to be. At one point the program left the main campus and moved into what was once the College’s agriculture class building on Magnolia Avenue in Larkspur, just south of the campus. Classes were offered both in the daytime as well as the traditional nighttime hours of 7pm to 10pm. Most of the instructors worked 24 hour shifts, so many of the first years’ classes were team-taught. When the classes moved to North Larkspur there were no refreshment facilities nearby for the daytime classes. The evening classes did not have this problem, for across the street stood the famous Pinky’s Pizza Parlor. The students quickly learned that if they brought a pitcher or two of the golden brew to the instructor’s table and engaged him in idle conversation they would reap the benefit. Once back in class, some of the instructors had difficulty focusing on their lesson plan and many a night the class was dismissed around nine. There were many student firefighters whose A.S. degree may have been obtained under somewhat fraudulent circumstances. In 1985 the Fire Science program was moved to the COM Indian Valley campus, in Novato, along with the Police Science and Auto Technician programs. At this time the college began to have budget difficulties and only six to nine Fire Science units were offered per semester, making it more difficult to obtain a degree in a timely manner. As the college experienced deeper cuts in classes there came the time when, if the class did not have 20 students registered on the first day of class, the class was canceled on the spot. So in the fall of 1996 after 33 years, the last two classes were offered. They were Fire Command 1-B, taught by Brain Mueser, Training Officer of the Marin County FD, and Fire Hydraulics, taught by Chief Bill Lellis. Meanwhile a new State Fire Training program was well underway that offered “Fire Officer Certification” upon completion of eight 40-hour State courses. Literally hundreds of Marin County firefighters came through our program and one must believe that it did, in fact, lead to the next generation of Fire Service Leaders. In addition to the credit program, the college also offered instruction to members of the community such as the Bolinas, Muir Beach, Inverness, Nicasio, and Stinson Beach volunteers. Also included was the Synanon Drug Rehabilitation facilities FD in West Marin, to name a few departments. These classes were very similar to the original California State Department of Education, Little Red Training Manual and were held in their facilities. The history of the Fire Science program would be incomplete without mentioning the role of a gentleman named Dr. Joe Burrezo, the Dean of Vocational Training and the Advisor to he Fire Science program. Dr. Burrezo began his career as a welder in Richmond. At the same time, he attended evening classes to obtain his college degree in Vocational Education. Every summer Joe would be off to some distant college in America working toward his doctoral degree. He was a true friend of the Marin County fire service, and on many occasion helped us get classes approved through the college administrators. The first graduate of the College of Marin Fire Science program, June of 1966. In June of 1966, Marin County FD Fire Warden Jerry Van Soest became the first ever graduate of the College of Marin Fire Science program, earning an Associate of Science degree. A World War II veteran, he was 38 years old at the time, and credited his wife for working to help pay for the cost of his education. He soon began teaching in the COM program. Van Soest would later retire from the Marin County FD as Assistant Fire Chief. Jerry Van Soest was born December 25,1927, and passed away on January 10, 2011 in Fall River Mills, California. Look forward to a biography on Jerry soon in our biography section.